Imagine taking a selfie, you post it on your public Instagram and tag the location. The location is the Vessel in Hudson Yards. You go on with your week then see that the selfie you took is now on a website for the Vessel and featured in their Instagram feed without them ever asking for your permission. 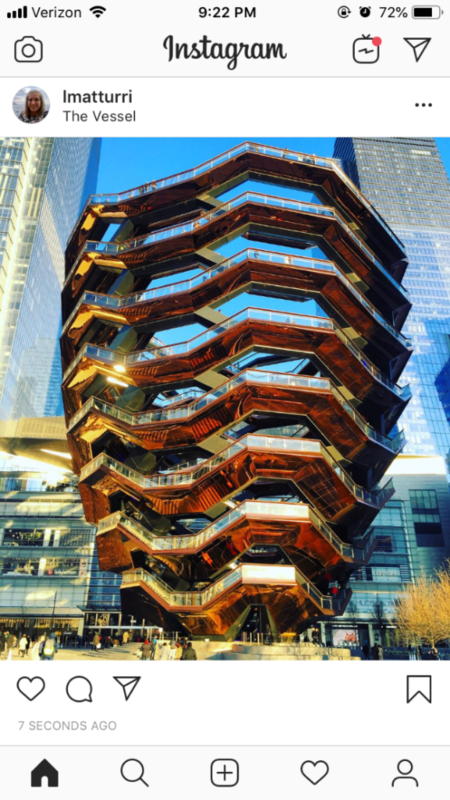 Even though you own the photo and copyright protection in the image, Hudson Yard does not need to ask permission or acquire your copyright in the selfie, because when you visited the Vessel, you gave up that right. I retain ownership of any photographs, text, audio recordings or video footage depicting or relating to the Vessel that I may create (the “Vessel Media”), unless otherwise agreed by me and Company. If I post any Vessel Content to any social media channel, I hereby grant to Company and its affiliates the right to re-post, share, publish, promote and distribute the Vessel Media via such social media channel and via websites associated with the Vessel or Hudson Yards (including my name, voice and likeness and any other aspects of my persona as depicted in the Vessel Media), in perpetuity. I understand that I will not be entitled to any compensation from the Company, its affiliates or their respective vendors in connection with the same. While the terms state ownership in the content is retained, it is a shallow statement because by posting any photos or videos, Hudson Yards and its affiliates can use your photo in any manner that they wish. Hudson Yards could even use your photo by reproducing it on postcards and making a profit, all while you receive nothing. This extremely broad license is toeing around the copyright protections a person retains in their photos and videos. Typically, when a person takes a photo whether with a professional camera or with their phone, the photo is copyright protected with the person taking the photo retaining ownership. The copyright laws protect any original work of authorship fixed in a tangible medium of expression. Taking a photo on your phone is considered an original work of authorship, fixed in a picture format that you can send, print, or post on social media. You have control of the photo and how it is displayed and disbursed. Ownership of content on social media is not a new story. Celebrities have been getting in increasing trouble for posting photos of themselves that were taken by the paparazzi. While celebrities are posting pictures of themselves, they do not have free reign to do so. Ownership of photos remain with the “author” which would be the photographer or a photo agency, such as Getty. When celebrities posts these photos of themselves, they are typically doing so without giving credit to the paparazzo or paying a licensing fee. Licensing fees for paparazzi photos can be very expensive. For example, a license of a recent picture of Taylor Swift could go for thousands of dollars and if that photo is then being used all over social media without a license, then the monetary value of that photo drops drastically to the point it is not worth anything. One of the exclusive rights available to an author of a copyrighted work is the exclusive right to reproduce the work. This means the photographer has the right to require a licensing fee in order to reproduce the picture and the right to receive credit as the author. Whenever these exclusive rights are violated, that action constitutes copyright infringement. Photographers have been able to fight this problem on Instagram by having fan accounts shutdown or by taking celebrities to court. For example, model Gigi Hadid was sued in January for posting photos on her Instagram without a license or permission from the photographer. She voiced her frustration with the agency that owned the photo as this not making sense since she is the subject of the photo. Other celebrities have vented their frustration when fan accounts are shut down because of copyright issues especially because the fan accounts are not posting the photos to make a profit but rather to show admiration for that particular celebrity and not for profit. However, this type of use by a fan account would most likely not be considered fair use. Fair use typically applies when the work is used for noncommercial reasons such as nonprofit education, commentary, criticism, or as a parody. It is arguable that photos used by fan accounts would not be considered fair use. These photos are reaching massive audiences and exposure all while the photographer is receiving no permission or licensing fees and the accounts are not meant to educate or act as a news source. For example, one Kate Middleton fan account has over 878 thousand followers and when paparazzi photos are posted on the account, the photographers are receiving no credit or licensing fees. These 878 thousand followers are publicly viewing a photo for no cost that should otherwise have been paid for by the fan account. While the account is not making profits, the massive amount of followers seeing these photos is money the photographer is losing. Therefore, with the fact that copyright law has such an impact on social media it might be time for an additional category of fair use to be developed, one that will address the growing role of social media with fan accounts. Instagram itself has redefined what it means for a person to own their photos. This is because if an account is public, anyone could go on that account and screenshot the photo and then distribute it as they wish without the photo’s owner realizing it, giving permission, or receiving licensing fees. The best way to reduce the chances of your content being used without your permission or without a license on any social media platform is to keep your account private, watermark the photos, and control who has access. If you have questions about copyright law, or permission on using a picture, consult WHIPgroup. WHIPgroup is leading counsel for U.S. and international technology companies. We specialize in patent and trademark law. © 2019 Whitmyer IP Group, Stamford, Connecticut.